A 'send' link for a template email to invite more respondents. 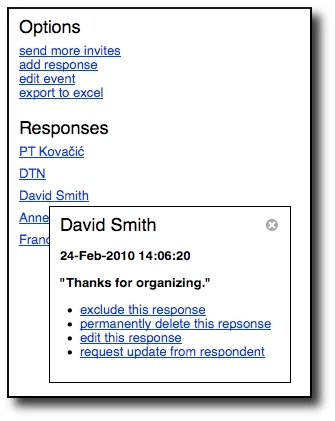 Add a new response yourself by opening a blank feedback form in a new window. A shortcut the edit page to make a change to the event. Premium users also get to export to excel from here. The list of respondents now works differently. Click on any name to show their details in a popup. This will show any comment, when they last updated their feedback and also fix the grid to show their times (even when you scroll around on an event that doesn't fit on your screen). You can temporarily exclude people as you try and find a match. You can permanently delete a response (e.g. if you have duplicates). You can yourself open their feedback page and fix any problems. Finally, another template email link makes it easy to request updates. This last option works well when you need chase people to be more flexible. People at the bottom of the list entered the fewest times. Click their 'request update' link and send them a personalised email. 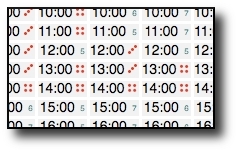 They will be taken to their previous response so won't have to start over when adding times. For fans of the little red dots (our near miss counters) who have very large groups to organize, we've added little numbers (when the failure count is more than four). If there is no green - look for the red dots first, or, failing that, mouseover the lowest numbers to see who is the problem. Hover your mouse over a time to see a popup with a list of the good and bad names.